Holiday shopping is extremely stressful, especially if you’re already juggling all of the daily tasks of being a good mom. If you’re not going to have one of our staff members do your shopping for you (for free) this holiday season, we reached out to some of the most popular mommy bloggers for a little help. Mommies everywhere rejoice! 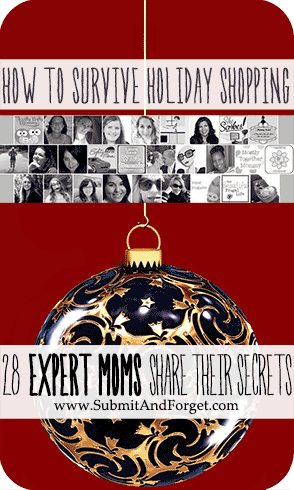 28 bloggers (or “expert moms” as I like to call them!) responded with their best-kept secrets and advice to juggling the horrors of holiday shopping with the treasures of being a mom. We’re so grateful to all of our participants – make sure to check out their websites and follow them on Twitter/Facebook for more helpful resources! What’s your #1 tip or piece of advice for shopping moms this holiday season? What’s your #1 tip or piece of advice for saving money when shopping this holiday season? “In the past, family members send out a mass email with a “wish list” so we all have ideas. But then the child almost always receives duplicate items. “Tip #1: Hit up your local dollar store for stocking stuffers – you can pick up great items for the whole family without breaking the bank. Tip #2: For snagging online deals, keep a watchful eye on deal sites like MoneySavingMom.com and SlickDeals.net. Check RetailMeNot.com for coupons before placing your order so that you don’t miss out on any additional savings, and make sure you complete your purchase through Ebates.com so you can earn a rebate. These strategies can help you get great deals on holiday gifts! Happy Holidays – We Hope This Helped You! I want to extend our deepest gratitude to all of the incredible bloggers that participated above. I hope this collection of tips/tricks is helpful to all of the mommies out there. Don’t forget to check out our free shopping service this year if you get a little too overwhelmed and need a free shopping assistant – happy holidays!